Self-injury is a coping mechanism. An individual harms their physical self to deal with emotional pain, or to break feelings of numbness by arousing sensation. Self-injury is any deliberate, non suicidal behaviour that inflicts physical harm on your body and is aimed at relieving emotional distress. Physical pain is often easier to deal with than emotional pain, because it causes ‘real’ feelings. Injuries can prove to an individual that their emotional pain is real and valid. Self-injurious behaviour may calm or awaken a person. Yet self-injury only provides temporary relief, it does not deal with the underlying issues. Self-injury can become a natural response to the stresses of day to day life and can escalate in frequency and severity. Self-Harm? Is that like Self-Injury? People use different terms for self-injury; SI, SH, DSH (Deliberate Self Harm), SIB (Self Injurious Behaviour), Self Mutilation, Cutting; some people even include self-injury when they say ‘parasuicide’. Hospitals and Doctors might use different words, but whatever words we use, are we talking about the same thing? LifeSIGNS feels that language is important when professionals are talking about self-injury, and talking to people who self-injure, but of course, we’re happy for people who self-injure to use whatever words and phrases they feel comfortable with. If you consider yourself a ‘self-harmer’ rather than a ‘person who self-injures’ then that’s fine! At LifeSIGNS, we talk about self-injury rather than self-harm because we see self-harm as a larger concept, and LifeSIGNS focuses on the narrower idea of self-injury. Self-harm is an umbrella term that includes a variety of behaviours that damage, or cause harm to a person. Self-injury falls under the umbrella of self-harm, and is a direct behaviour that causes injury and damage to one’s body. At LifeSIGNS, we believe the intention of self-injury is to release tension and seek relief from distress; we focus on the intention and the fact that people rely on self-injury as a coping mechanism. LifeSIGNS is funded by your donations. 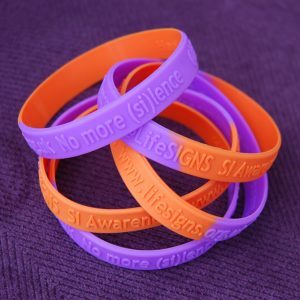 We’re run by volunteers with personal experience of self-injury. Self-harm includes many harmful behaviours such as self-injury, but includes such diverse matters as eating disorders, risk taking behaviour, drug and alcohol misuse. Although we’ve put ‘hair pulling’ under self-injury, we don’t particularly mean trichotillomania. Although some people pull hair out to seek relief for their distress (just like in our definition of self-injury), some people are compelled to pull their hair and it does not relieve their distress – in fact it may cause more anxiety. We can also consider self-neglect (including a lack of hygiene, lack of health-care behaviours and extreme selflessness) to be indicators of low self worth. We might describe a massive acute drug overdose as suicidal behaviour, but if someone is self-medicating in a chronic manner (over a period of time) then we’re more likely to describe it as self-injury, especially if the person explains their actions are to ‘help them cope’ or ‘help them forget’. At LifeSIGNS, it’s all about self-definition, we listen to people, we don’t judge or throw labels around. 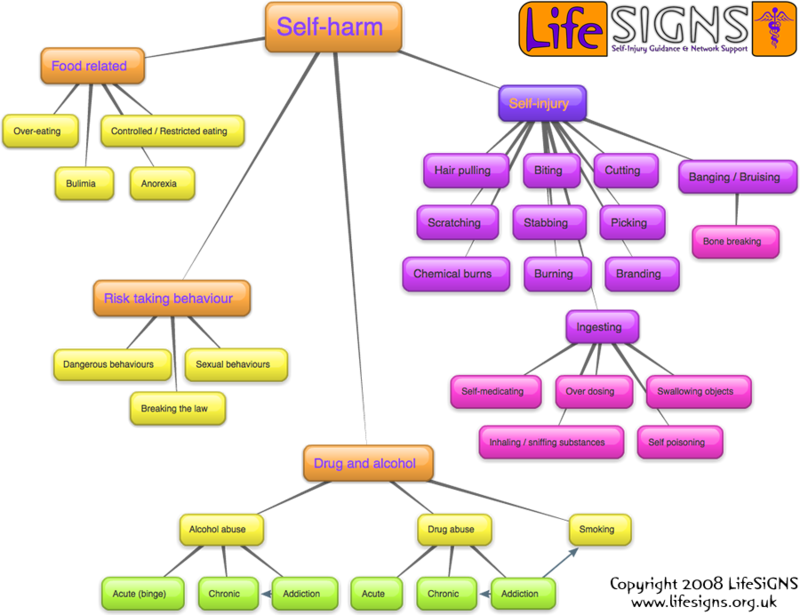 We’re pleased to offer our explanation of how self-injury is related to self-harm, and here at LifeSIGNS, we know we can offer great information about self-injury, but that we’re not going to stretch our expertise to eating disorders and drug abuse, we know other organisations have expertise in those realms. So that’s why our name is made up of the acronym SIGNS – Self-Injury Guidance & Network Support, and that’s why we support SIAD – Self-Injury Awareness Day, every 1st of March. Thank you life signs for this info. Now I know how to help my cuts.